Schools out for summer! So, we have spent some time reflecting on the 2017-18 school year. We are so pleased with the success of arts enrichment programs provided in a number of schools across the Black Belt region through the leadership of our Black Belt Teaching Artists. These Teaching Artists were placed to meet the specific requests of the schools’ teachers and/or administrators with the goal of inspiring students through integrating arts and the curriculum. Black Belt Treasures Cultural Arts Center (BBTCAC) Art Programs Director Kristin Law coordinates the Black Belt Teaching Artists program. She was assisted this year by Jo Taylor and Stephanie Wilkins, both former classroom teachers, who have worked as DeltaCorps Service Members. The DeltaCorps program is a partnership of AmeriCorps and Delta Regional Authority which provides service corps members to impact change in communities across the Mississippi Delta and Alabama’s Black Belt region. Jo and Stephanie have been instrumental in coordinating the placement of Black Belt Teaching Artists in schools and with community partners during 2017-18. All of these programs would not be possible without the support of community partners and BBTCAC’s generous funding partners like the Black Belt Community Foundation (BBCF), Community Foundation of South Alabama (CFSA), and ALA-Tom RC&D; with Teaching Artist training support through the Alabama Arts Alliance and the Alabama State Council on the Arts. In addition, education grants from provided to individual schools and school systems through Alabama State Department of Education’s (ALSDE) Alabama Arts Education Initiative (AAEI). On December, 15 2017 four Black Belt Teaching Artists, Kristin Law, Sheila Hull, Stephanie Wilkins, and Jo Taylor arrived at Camden School of Arts and Technology in Wilcox County to demonstrate and teach the students various visual arts mediums. 7th and 8th Grade students were taught watercolor and acrylic painting techniques, printmaking, and hand built pottery making techniques. The photo below shows examples of clay faces that were created during Kristin Law’s lesson on face jugs. This program was made possible thanks to a grant by the Alabama State Department of Education’s (ALSDE) Alabama Arts Education Initiative (AAEI) to Wilcox County School System. In early February, Vassie Welbeck Brown was placed at Southside High school in Dallas County to teach, inspire, and model theatrical skills to the high-school drama team. Photographs below are of Vassie in action! This program was made possible thanks to a grant by the Alabama State Department of Education’s (ALSDE) Alabama Arts Education Initiative (AAEI) to Dallas County School System. On February 8, 2018, Emily Blejwas, author of Once You Know This, visited J.E. Hobbs Elementary School and Wilcox Academy to discuss the book and the writing and publishing process. The children shared their excitement following this program, and that they were greatly inspired by a “really famous author”. These programs were made possible through a grant by the Black Belt Community Foundation (BBCF) and ALA-Tom RC&D. Also in February, 2018, Donna Pickens traveled to Dallas County’s Southside High School to teach and help the students create a mural that is now proudly on display for all to enjoy at Southside High School. This program was made possible thanks to a grant by the Alabama State Department of Education’s (ALSDE) Alabama Arts Education Initiative (AAEI) to Dallas County School System. We are forever grateful for their support and funding to make these art instruction classes possible! Sam Williams and Salaam Green made guest appearances at the Monroeville Elementary School for the Pre-K to Fourth Grade classes on May 11th. Sam instructed students in crafting creative clay animals, while Salaam emphasized the southern tradition of storytelling. Both guests were exciting and fun for all ages to learn from! Thank you to the Community Foundation of South Alabama (CFSA) for providing a grant allowing these instructors to teach and demonstrate art to the students of Monroeville Elementary School! On March 16th – Students from Selma’s Southside High School visited Gee’s Bend in Boykin, Alabama to learn about the quilt mural trail, the art of quilt-making from the Gee’s Bend Quilters, and watch the Gee’s Bend Play, which was performed by local actresses and actors from Boykin, Alabama. This program was made possible thanks to a grant by the Alabama State Department of Education’s (ALSDE) Alabama Arts Education Initiative (AAEI) to Dallas County School System. On May 14th and the 15th – Linda Munoz instructed and taught the Third Grade class of R.C. Hatch in Uniontown, Alabama the art of creating a quilt inspired mosaic. Students enjoyed collaborating and creating a cohesive pattern using colorful glass tiles with Linda. Thank you to the Black Belt Community Foundation (BBCF) for making this program possible. Salaam Greene (pictured), Emilie Oglesby, and Sam Williams visited Uriah, Alabama Blacksher School third grade class on May 11th. Emilie taught the students mixed media while Salaam enthralled students with the art of storytelling. Sam taught the third graders how to create imaginative, small, clay animals. Thank you to the Community Foundation of South Alabama for their contribution to BBTCAC for arts education in Alabama’s rural counties. Salaam Green entertaining the students with exciting stories! On May 7th – 9th and May 14th Rebecca Koontz visited with the Third Graders at Greensboro Elementary School and created African masks and Wayne Thiebaud inspired food paintings. The children enjoyed creating colorful masks and using media such as watercolor, to create a food inspired work of art. Thank you to the Black Belt Community Foundation (BBCF) for their contribution to BBTCAC for continued arts education programming across Alabama’s Black Belt region. On May 2, Black Belt artists Andrew McCall, Kristin Law, and Jo Taylor led an Arts Immersion Day at Camden School of Arts and Technology’s. 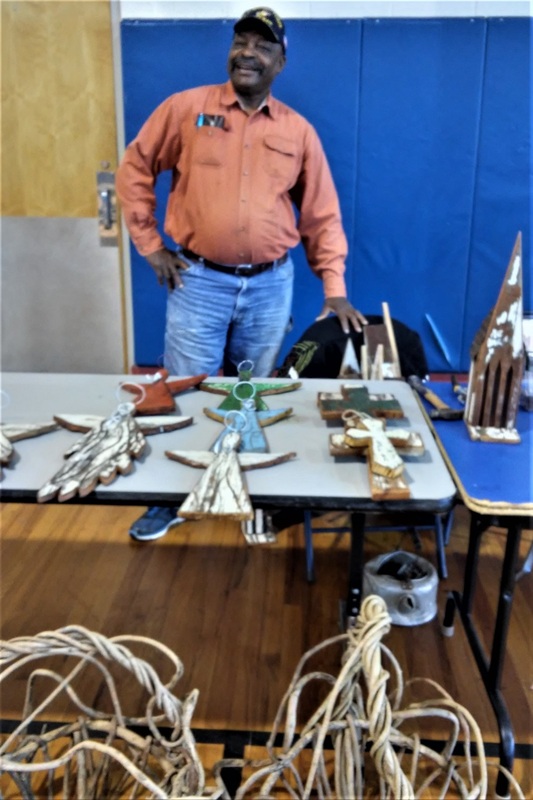 The students enjoyed hands-on learning and watched Andrew demonstrate basket weaving, Kristin demonstrate wheel throwing, and printmaking with Jo Taylor. This program was made possible thanks to a grant by the Alabama State Department of Education’s (ALSDE) Alabama Arts Education Initiative (AAEI) to Wilcox County School System. The week of May 14th through 18th, Black Belt artists, Kristin Law and Jo Taylor taught students at Southside High School in Dallas County the art of relief printing. The students learned several different techniques and created an assortment of original prints. This program was made possible thanks to a grant by the Alabama State Department of Education’s (ALSDE) Alabama Arts Education Initiative (AAEI) to Dallas County School System. On May 14th and 15th Vassie Welbeck Brown (Storytree Company) entertained Pre-K – Third Grade Students at J.E. Hobbs Elementary School in Wilcox County. Vassie’s animated and expressive stories captured the students and inspired the youth to understand the heritage and art of storytelling. During this time, Internationally acclaimed folk artist Charlie “Tin Man” Lucas led children in making their own folk art inspired sculptures. 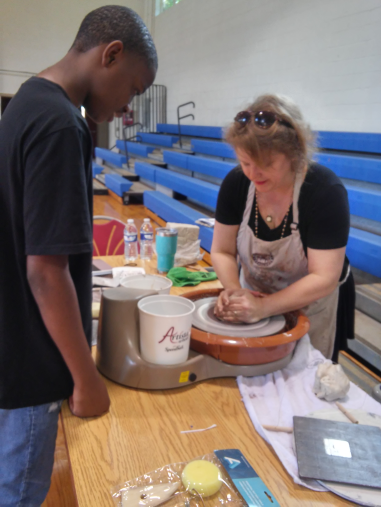 These programs were made possible thanks to a grant by the Alabama State Department of Education’s (ALSDE) Alabama Arts Education Initiative (AAEI) to Wilcox County School System. Last but not least, BBTCAC has enjoyed a partnership with Auburn University’s College of Liberal Arts this summer by hosting Living Democracy Fellow Laura Agee, a Camden native. Laura has engaged in building community through the arts! If you would like to read her weekly articles about Camden and people who are making a difference, visit http://www.cla.auburn.edu/livingdemocracy/blog/category/camden/. We have been busy with Summer Art Camps, arts enrichment programs (in partnership with Wilcox Artworks) at BAMA Kids and the Camden Community Youth Development Center, training sessions in preparation for the 2018-19 school year, and will be hosting an arts integration workshop for Black Belt area School Administrators in late July. If you would like to learn more about joining our arts enrichment efforts as a Teaching Artist or Volunteer – please contact Kristin Law, Art Programs Director, at (334) 682-9878 or kristin@bbtcac.com.